So many things went wrong on race day. It’s hard as I write this to remember all of them, and it’s not like my focus is solely on what went wrong, but I would be remiss to not mention them in great detail. Roya and I arrived in Kona on Monday, October 3rd. We got off the plane and were met immediately with hot, humid, and sunny weather. For a vacation, that would be a welcomed greeting, but I disliked it the moment we disembarked. With 9 other friends joining us on this vacation, we were looking forward to spending time together, but with their collective arrival two days away, we checked into a hotel right near the center of activity for the Ironman: the corner of Palani Drive and Kuakini Parkway, otherwise known as the “hot corner”. 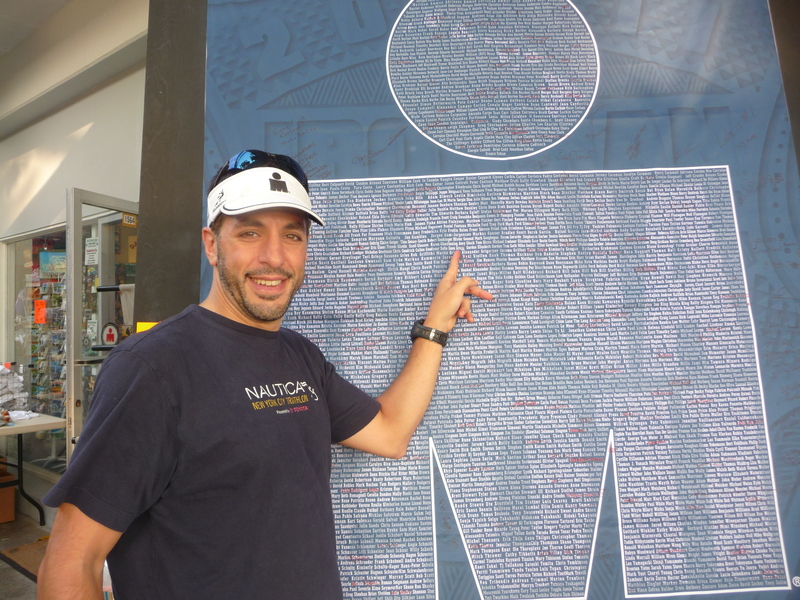 At the Ironman Expo, my name is on the board. Guess that makes it official. 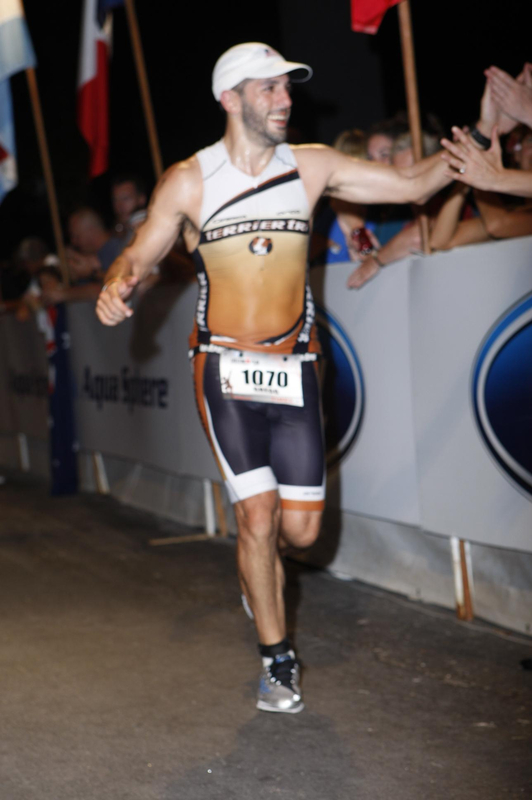 I met a great guy named Steve Kern while competing at Ironman Brazil in 2008 and through various means, he too got into this race in Kona. I called him as soon as we checked in and found out that he was staying at the race hotel across the street, the King Kamehameha. We met that afternoon and chatted a bit about the race (he spectated this event last year). The next morning, I headed down to the water to do a training swim. My coach had prescribed that I swim for 30 minutes, then run for an hour along Ali’i Drive. The water was warm, perhaps around 78 degrees, and it felt saltier than normal ocean water, but not to the point that it would be a problem. 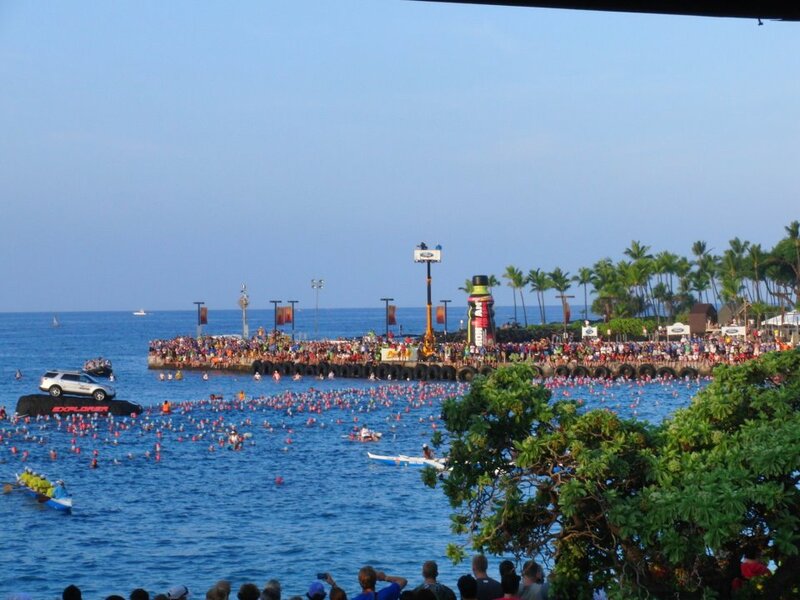 The swim went fine, and thereafter, the run on Ali’i was also good. It was hot though, and it was barely 9 a.m. I met Roya at the famous Lava Java restaurant which is where triathletes go to see and be seen. Thereafter, it was a nice lazy day. On Wednesday, Steve and I arranged to do part of the bike course. We drove to a section of the course that marks the end of the Queen K highway and which marks the ride up to the turn-around at the town of Hawi. Overall, we wound up cycling about 36 miles in two hours even, but the ride up to Hawi was difficult. With strong headwinds and a steady incline, we often were going no faster than 10 mph. On the descent, I didn’t even have to pedal and was able to get up to 42 mph. That itself however was non sustainable thanks to strong crosswinds, so strong that I came within inches (or so it felt) of crashing off the road into the lava fields and brush on the roadside. I called it “white knuckle riding”. That afternoon, Steve drove Roya and our things to the house that we rented with our other friends while I rode my bike there. It was about 4.5 miles from the race area and was just lovely by all accounts. Eventually most of our friends arrived, but 4 got stuck in LA and missed their connection, so they’d be a day late. The house had no air conditioning, but that was a good thing, at least for me, as it would help me to acclimate to the humid conditions I’d be facing on race day. On Thursday, I headed back to the race area and did another 30 minute swim. Again, it went fine and I felt good. I also got a chance to see quite a few more triathletes. It was actually fairly intimidating. This race features the greatest triathletes in the world so I definitely felt out of place even though I also paid my dues both physically and administratively. I made sure to hightail it back to the house where I’d no longer be within sight of all of it and where I could relax mentally. That evening, the final group of our entourage arrived. Roya and I went to a banquet hosted by the race organizers that featured a huge buffet (with so-so food), and a large stage where they held a production with Hawaiian dancers, fire twirlers, music, videos, etc. It felt great to be a part of that, but the pit in my stomach with race day approaching made it somewhat bittersweet. I couldn’t really enjoy this to the fullest. A strong rainstorm canceled the latter half of the banquet, and Roya and I headed back home. 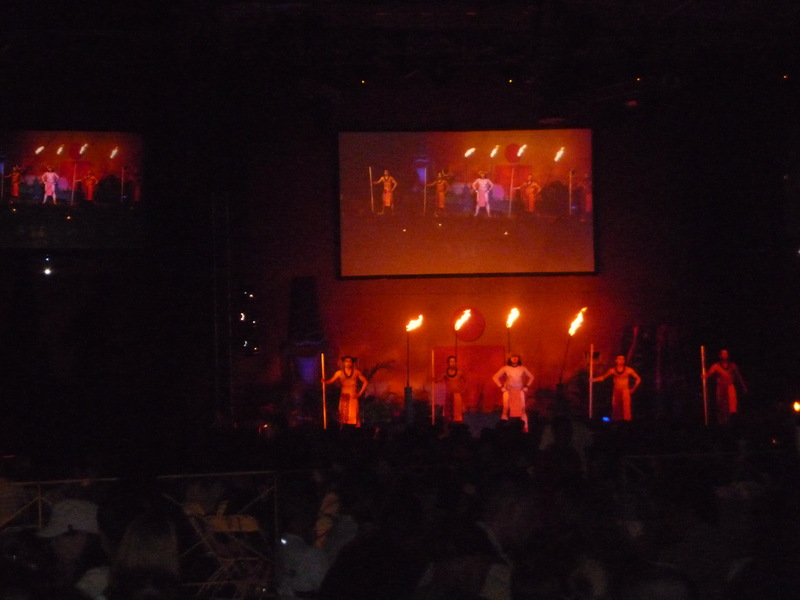 Part of the theatrical show at the Ironman Gala. Friday was a rest day for me. No activity, no leaving the house, nada. Roya and some friends went on an excursion to see lava flows and other sightseeing spots. Others walked down to the local beach. I stayed home, and I was glad to do so. Later in the afternoon, I was scheduled to check in my bike along with the rest of the 1,900 or so athletes, and when I showed up, it was at the same time as the woman’s defending champion, Mirinda Carfrae from Australia. If she weighs 110 lbs, I’d be surprised. This tiny little woman is the defending world champion! I couldn’t believe my eyes. After doing a walk-through the transition area to fully understand how things would work on race day, I headed home to a great home-cooked meal of pasta and meat sauce, courtesy, of good friend John Pace. Roya and a few others hadn’t yet returned, so it was just a few of us feasting together, but I let them know how honored I was to have them there to support me for such a big event, and how I couldn’t begin to thank them for spending all this money to fly here. Yes, it was Hawaii and probably didn’t require a lot of arm-twisting, but still, huge thanks were necessary. That night, I went to bed around 9:30 or so and surprisingly, I slept quite well. This is in stark contrast to Ironman Germany back in July where I maybe got an hour and a half in total sleep over the course of 6+ hours. Waking up the next morning, I was in good spirits and went through my normal morning ritual. Good friend Brad Olsen volunteered to drive me that morning and was obviously very excited despite the cruelly wee hour of the morning. Once dropped off at the race start, I headed through the various requirements, of getting my race number inked onto my arms, of getting weighed for the medical staff, of ensuring that my race timing chip was properly attached, etc. I got my transition area set up rather quickly and was ready to go with well over an hour left till my race start at 7 a.m. Steve and I hooked up and chatted a bit, then headed to the front lobby of the King Kamehameha hotel where we met his girlfriend and other friends. I realized at one point that I had forgotten my watch at the house, so I called Roya and asked that she and/or Brad hightail it to the hotel to bring it to me. As it turned out, our entire entourage headed out at the same time and all came to the lobby to hang with me before the race start. That was a welcome way to pass the time and deal with the nervous emotions that were growing quickly. Finally, I bid adieu and headed to the swim start. It was crowded and I could most definitely feel the nervous energy being emitted from the stud athletes all around me. I realized then that it made no sense for me to be nervous since I really wasn’t competing with them; I was in this for the experience and the honor of competing at the world’s greatest endurance event. Just before I headed down the stairs into the water, I saw an old friend from my training days on Long Island named Barbara Cronin-Stagnari. 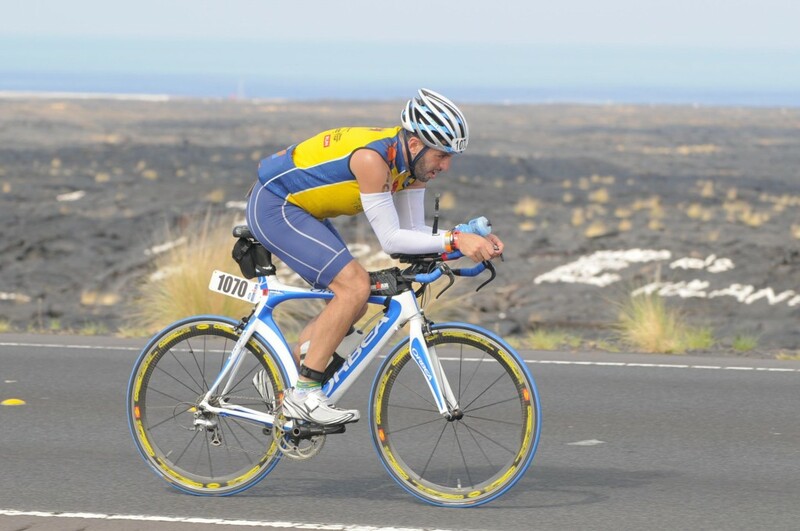 She is a tremendous athlete and has qualified for Kona several times before. I had known that she was Kona for this race but had failed to see her the entire week. It was good to see a friendly face and to wish her well. 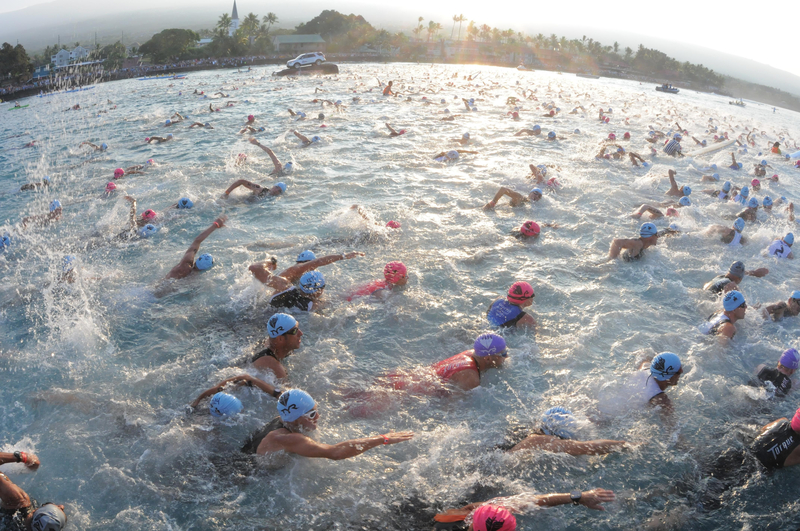 Within minutes, I was in the water and I slowly breast-stroked to near the start line. It was deep enough where we couldn’t stand, so we all treaded water and tried to remain calm. I knew that my watch was set perfectly to the race clock and counted down from ten minutes to nine, to eight, etc. Finally, with a minute to go, I looked behind me and took a long mental snapshot… of the crowds, of the athletes bobbing in the water, of the scaffolding that made up the finish line area, the palm trees, everything. Age groupers preparing for the swim start. Before I knew it, the cannon went off with a tremendous boom. We were off! Having purposefully floated to the rear of the group, my plan was already working out splendidly by allowing the fastest athletes to swim up ahead, thus reducing the number of times I’d be swum over, knocked, punched, grabbed, submerged, etc. These are not purposeful acts by other athletes, usually, but are just things that happen as everyone swims hard to the first buoy marker on the course. It’s a mass swim start. I tried to let the swarm get a head start to avoid the madness. 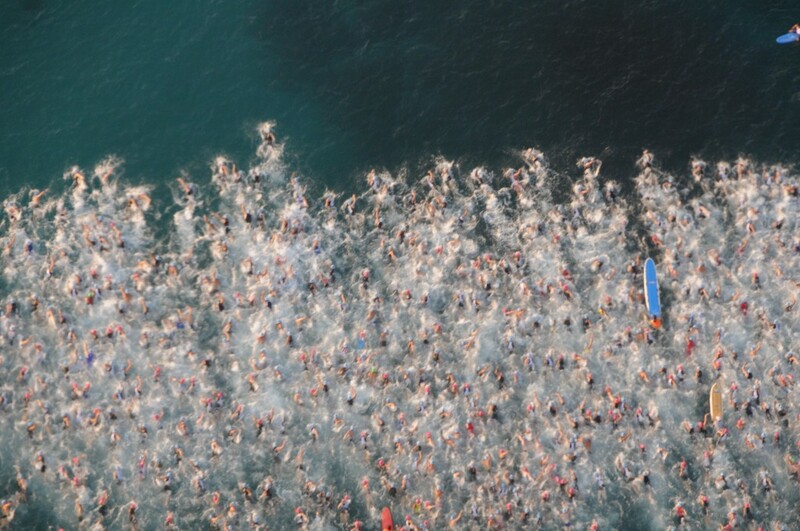 Another view of the mass swim start. I was very self-aware and remember so much about this swim, but it basically boiled down to not putting out a tremendous effort, and finding a good swim rhythm despite the bigger-than-expected ocean swells. I took about 45 minutes to get to the sailboat that marked the turning point of the swim course. I made that right turn, breast-stroked for the short 100 yard or so to the final turn (picture a U-shaped course), then got back into the free-style rhythm and headed home. I was fortunate to find a number of swimmers who were about my speed and whose feet I could swim behind, thus providing a bit of a draft. That is considered to be a legal strategy in the swim whereas doing so on the bike is illegal. Our group eventually coalesced into a group of 20 or so swimmers, and we took it easy trading turns until we finally made it back. The return trip took a bit longer though and when I finally made it to the shore, it had taken me 100 minutes, 10 minutes longer than I had hoped for. I was plenty okay with this though and was excited to get onto the bike. Once in transition, I took my time getting on my cycling clothes, applying sunscreen and chamois cream, and ensuring that I was fully ready for this long leg. I did notice that despite not having worn any clothing in the swim except for triathlon shorts, I had an abrasion on my neck from having to turn to breathe and having some neck skin rub against itself. Seems so odd to have gotten chafed there, but it’s obvious to me that the salt water caused it. I finally ran around to get my bike, headed out of the transition area, and got to the mount line where I hopped onto a piece of carbon fiber equipment that would be under me for many hours to come. 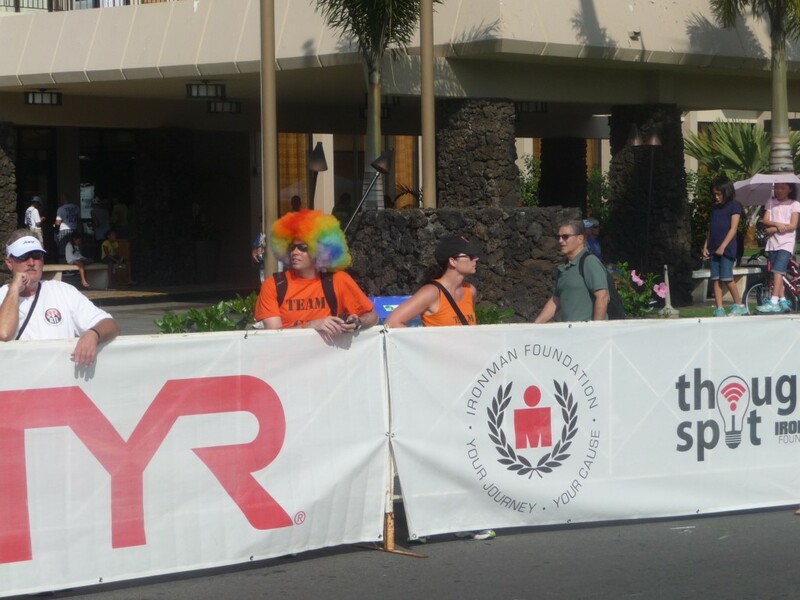 I headed up the hill on Palani Drive to the first turn and immediately saw Brad who was wearing a huge rainbow-colored wig as well as Roya and the rest of Team GG. 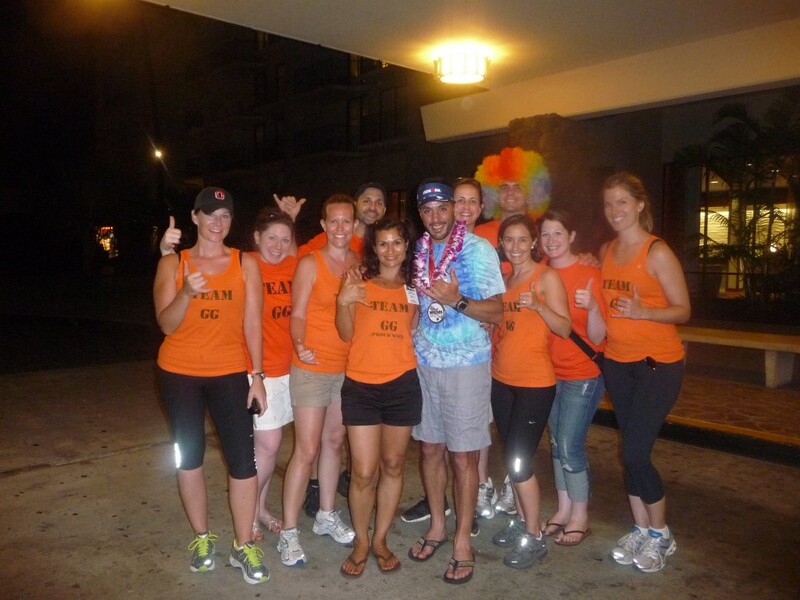 Roya had actually designed and gotten everyone to wear orange T-shirts that read “Team GG” on the front, and “Finish or go home” on the back. It was easy to spot everyone and I couldn’t help but smile ear-to-ear given how loudly they were cheering. They were at the hot corner which is so-named because of the course layout on the bike and run, whereby athletes pass by a total of 7 or 8 times. At the top of Palani Drive by the “Hot Corner” with 112 miles cycling ahead of me. This Kona bike course actually features two out-and-back sections; that is, sections where the course goes in one direction for a while, then turns-around and heads back from where it started. The first out-and-back took me from Palani Drive along Kuakini Parkway to a particular turn-around, but I expected it the turn-around to be further than it was. So, when I got back to Palani Drive, a few of the Team GG members weren’t there. 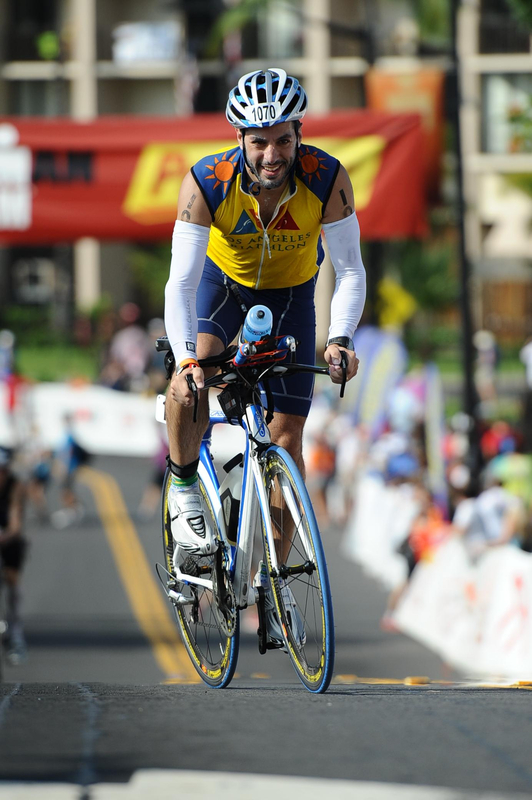 I was still in very good spirits and headed out onto the Queen K Highway feeling very good. For the next two hours, I felt as I was following a great race strategy, which again was to produce a low effort level and find a good rhythm. I was taking in nutrition via granola bars, energy gels, and sports drinks and everything felt great. At one point, I saw a helicopter approaching, then a series of vehicles with flashing lights. I realized that they were following the race leaders who were very far ahead. In actuality, the pros started at 6:30 a.m. whereas non-pros started at 7:00 a.m., but it made no difference to me. These guys were flying! Some time thereafter, the female pros went screaming by as well. I made the turn off of the Queen K Highway and onto familiar ground as that was the spot where Steve and I had done our practice ride just a few days earlier. I was relieved to be familiar with the course and I generally felt good climbing up to Hawi even though it was at an abysmally slow speed. At the turn-around in Hawi, I stopped for about four minutes to eat a sandwich, then headed down the super-fast descent. I hit speeds of 40+ mph and was fortunate to not have to white-knuckle it since the cross-winds seemed less prevalent. Once back onto the Queen K, I was met with some strong headwinds and some uphills, but I figured that they’d be temporary and that I’d be back at transition within a couple of hours. Well, I couldn’t have been more wrong. Turns out, I felt so great on the way out because of strong tailwinds which, naturally, were my headwinds coming back. I had a very hard time maintaining a good speed and I wound up burning a lot of calories just to keep the effort going. I remember in fact heading downhill and trying to coast so that I could rest the legs, and then seeing my speed rate reduce! I was actually going slower downhill! 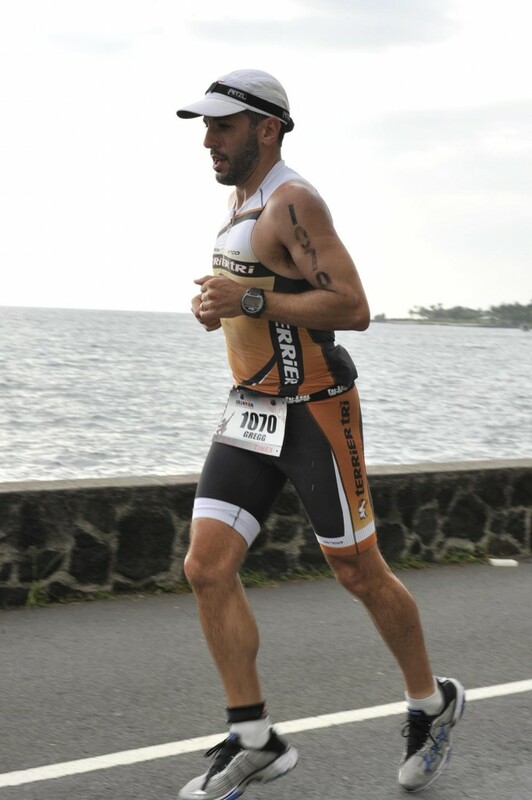 I thought to myself that the laws of physics just must not apply in Kona. I read a posting by one of the pro triathletes that the road temperature on the bike course was north of 130 degrees, when factoring in the fact that the black lava fields soak up the sun’s heat and blast it back out onto the black-tar road surface. That, combined with the sun’s strong rays and not an ounce of shade to be found anywhere, can have a debilitating effect on athletes, and I was proof positive that it can destroy a man. On the Queen K Highway, with lava fields beside me. I expected it to take me about two hours to pedal around 35 miles into the headwinds. In fact, it took me nearly three hours. It was about an hour into this stretch when I began to really suffer. It wasn’t just that my GI system was beginning to reject energy gels, and that I was both thirsty and bloated with consumed liquids, but that my mind was starting to go into the dark places where negativity becomes rampant. I was despondent, upset that I was ultimately going to affect my finish time goal, and desperate to just get off this damn bike already. With about 6 miles to go, the bike course adjoined the run course where the fastest athletes were running their way back into town. In reality, the fastest of the fastest finished their races before I even finished the bike section! That too led to some mental fatigue. I made the final turn off the bike and headed into the transition area, and was glad to finally enter the run section. I had trained well for this and felt as if I’d have a chance at redeeming the bike experience. I got into transition, did a full wardrobe change into new running clothes that featured my triathlon team’s logos (Terrier Tri), applied more sunblock and chamois cream, then headed out. As I did, I remember hearing the race announcer, a famous guy within the Ironman community named Mike Reilly, announce the finish of several athletes. I smiled and looked over to the finish line with amazement, and couldn’t wait for that to happen to me. As I headed up Palani Drive to the hot corner, I was sure I’d see Team GG but they weren’t there. I figured that they had headed up the road a bit, and sure enough, when I got onto Ali’I Drive on the way to my first turn-around, there they were. The first sight I saw was Brad with that crazy clown wig. He was apparently the look-out man, and when he saw me, he sprinted down to the rest of the group with the mannerisms of a madman! Once I neared the group, they chanted, screamed, shouted, cheered, and generally went crazy, so much so that other athletes who were with me remarked to me afterwards that I was lucky to have such a maniacal crew. Brad with the clown wig. Hard to miss him! It should be noted that their energy was directed towards many other athletes as well, and that they were recognized both by the Ironman company media and several other media publications for their show of spirit and camaraderie. I ran well until about mile 2.5 where I decided to walk through the aid station. These stations, positioned about a mile apart throughout the run course, offered water, ice, cold sponges, sports drink, cola (for caffeine), and some food (oranges, bananas, power bars, etc.). I got some nutrition and decided to walk a bit more. Thereafter, feeling weak, I found myself incorporating a run/walk strategy that was haphazard but totally necessary given how I felt then. At the turn-around at mile 5, I turned to acknowledge some friendly volunteers, then nearly lost my balance and just barely avoided crashing into some barriers. I righted myself, then walked slowly to the next aid station for two cups of cola. It helped quite a bit, almost instantaneously, and I was able to jog a bit thereafter. Early in the run leg, on Ali’i Drive. Within a few hundred feet though, I came across a guy who was bent over against a fence. I walked over to him, put my hand on his back, and asked if he was okay. He said that he felt like vomiting, so I suggested that we walk together and if he does vomit, at least he will have made some forward progress before doing so. He agreed, and I then asked him a series of questions to take his mind off of getting sick. It seemed to work, and when we got to the next aid station, I made sure he ate half of a banana and drank water. Turns out that he was 70 years old, competing in his 7th Ironman World Championship, and had posted a personal best of 12 hours and 50 minutes or so not that long ago. Finally, after about 25 minutes or so, I asked if he wanted to try and jog a bit. He declined, but told me to go on ahead. I didn’t want to leave him, but he assured me that he was quite fine. So, I began jogging and while I didn’t feel great either, I tried to make it to the next aid station before walking, and I wound up incorporating that strategy thereafter fairly successfully. It should be noted that the older guy, Al, wound up walking the entire marathon course in 7 hours and 55 minutes. I never did see him again but it felt good to know that I may have helped him avoid quitting. When I made it back to Team GG, along Ali’I Drive, I again first saw Brad’s crazy wig and made it my decision to not walk in front of them. That worked until I saw Roya and asked her to walk with me for a bit. I remember telling her that so many things were wrong that I didn’t even know where to start. I could see the sense of extreme worry in her eyes and I felt bad about causing that, but I wasn’t thinking that clearly and just wanted to vent a bit. I stopped for about 30 seconds to give her a deep, long kiss, then set out on my way. A few of my friends decided to run alongside me on the sidewalk, and when I noticed that a few were actually ahead of me, I yelled out, “What, are you trying to show me up?” That got a good laugh, and they made sure to slow down, and after a few hundred feet, wished me good luck as I approached the Queen K Highway. At about mile 11, it was dusk and as I looked over the horizon, the sun was setting in a most glorious way. I remarked to another athlete that one of the perks about walking, at least at that moment, was that we get to enjoy a really special sunset. He appreciated the comment, and we chatted a bit, but then I set off, back on my strategy of running to the next aid station. For the most part, this worked out well for me, but I had to abandon it several times when coming upon an uphill that just seemed easier to walk. I made sure that my walk speed however was brisk and not a mere shuffling of the feet. Finally, night fell and I turned on a headlamp that I brought along specifically for this happening. It was a Godsend since it was very dark along the Queen K.
At mile 16, the course turned off of the Queen K and into a section known as the Natural Energy Lab. It’s a mile downhill, a mile parallel to shore, then two miles back out to the Queen K again. I ran most of it and at the turn-around, I found myself feeling quite good. In fact, my 18th mile time was among the fastest I had recorded all day! I was pleased with that and decided that while I wouldn’t beat my time from Ironman Germany, I had a legitimate shot at beating my time from Ironman Brazil, and that would be my goal hereinafter. Mile after mile, uphill or otherwise, I refused to give in to walking… except for aid station stops. I stopped at every one, and decided based on how I was feeling, whether I’d take water, cola, warm chicken broth (for salt), or any combination therein. I kept clicking off the miles, checking and re-checking my watch and my time calculations for a predicted finish time, and pressed on. My feet were unbelievably sore, as were so many other parts of my body, but I refused to walk. When I passed the mile 24 marker, I realized that I was a mere 2.2 miles from finishing. Psychologically, this was a huge milestone. 2.2 miles was nothing, and I knew for sure that I would beat my Ironman Brazil time. 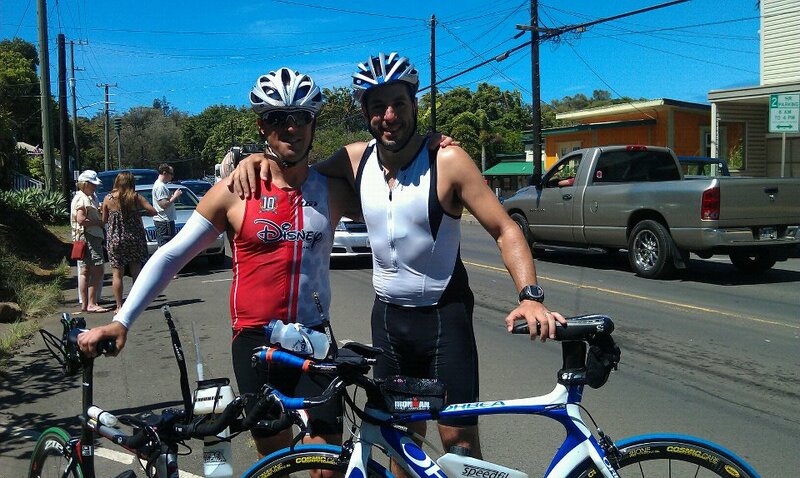 As I headed up the final uphill on the Queen K up to Palani Drive, I saw Brad along the roadside. His wig was gone, but his energy was as strong as ever. Up ahead there was a section of spectators who were cheering on an athlete who was walking, but who decided to run upon seeing them. I vowed that no matter how tired I was, that no matter how assured I was of beating my Brazil time, that I’d run this entire long uphill. Seeing Brad somewhat near this group made that resolve even stronger. He pulled up alongside me, said some amazing things to me that only best friends can share, and then sprinted back towards the finish line. I made the turn onto Palani and had to run downhill for about a quarter mile. With my terribly sore feet and toes, it was torture, but I was not going to walk no matter how much pain I was in. I made a few more turns, then made the final one onto Ali’I Drive. Spectators, athletes who had already finished, and everyone else were incredibly supportive and complimentary. “You did it! Congratulations! You look so strong! 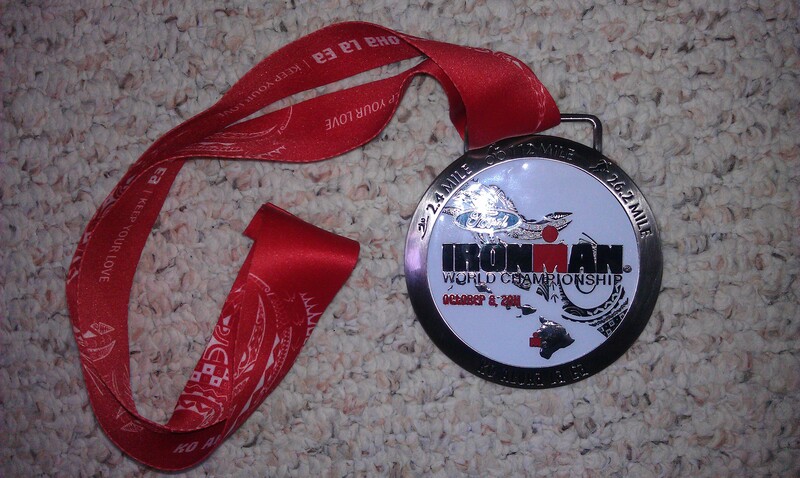 Nice job Ironman!” I was so moved by all of this, and I tried to slow my gait to make this last longer. I looked left and right, smiled as much as I could through the terrible pain, and tried to find where the finishing chute began. Suddenly, there it was. I slowed up a bit, entered into it, and looked down with shock and amazement. I had done it. It was now over. This finishing chute was about 100 yards long and about halfway down, on both sides were the amazing Team GG members, cheering like wild banshees. I high-fived each one of them, smiled through my tears, high-fived even more folks lined up along the barricades, and finally headed in a slow jog to the most famous finish line in all of endurance racing. I ran up the ramp looking down because I was so in awe of the whole experience. Slapping palms with people in the finishing chute. Big smiles after getting over big hurdles. “Over 85 triathlons in his career, from New York City, New York,… Gregg Gordon… you did it. You are an Ironman, Gregg, yeah again.” I probably heard what he said then, but hearing it again whenever I re-watch the video sends chills down my spine. In my previous three Ironman races, “You are an Ironman” hadn’t been said despite how badly I wanted to hear it. This time it was. The confluence of despair and triumph. My favorite photo. The race organizers were very clear about family members not being allowed into the finish area, but sure enough, my Roya was there waiting to put a Lei around my neck. That’s Roya; undeterred and so very determined to get her way. She Lei’d me, and a handler then helped me to leave the area and head to the finisher’s tent where I’d get my medal, my finisher’s t-shirt, and various other goodies. I tried to be gracious for her help, but with her grabbing my arm, I felt as I was being handled like a criminal, and I felt like yanking my arm away. I also had a hard time communicating. I was absolutely and thoroughly exhausted mentally. I wasn’t thinking clearly but I knew that I didn’t want to keep moving. It took about 20 minutes and a massage, then a change of clothes, until the real me returned. Roya and I headed to the lobby of the King Kamehameha hotel and met the rest of the group. They were ecstatic, and you know what, so was I. I showed them the very impressive finisher’s medal and shared just a few snippets from the day itself. I then handed my bike to Brad who would ride it back to our house, then got into one of our cars and relaxed on the way home. Once we all re-joined one another at the house, I told more stories, of how great it was to see them, of how miserable the return bike ride was, of how I nearly fell over on the run, of how determined I was to run the final dozen or so miles, etc. It was just after midnight at this point and everyone was exhausted. In reality, while I had raced for fourteen hours, they had been up for nearly as long as I had. And while they had breaks to sit down, eat, drink, etc., it was still a long day. Team GG right after I finished the race. I’m feeling much better and so appreciative of such amazing support. From left to right, Leah, Angie, Karen, John, Roya, me, Cindy, Brad, Karen, Allison, and Amy. When I got into bed that night, I smiled… not because I was proud of how I had done; in fact, I was fairly devastated to have performed so poorly. No, I smiled because it was over. Ten months of training was over; I could go back to having a social life; I could work late without feeling guilty about skipping a workout. In so many ways, I could finally be a better husband to Roya. So, I smiled at these thoughts, and I held onto Roya for dear life, grateful beyond description to have such an amazing and supportive partner. Images of the race however permeated my thoughts and I wound up sleeping restlessly as I recounted so many places where I suffered mightily. It was as if the things I had seen that day were seared into my mind, and unwillingly, I felt as if I was encountering them over and over again on an endless loop. Not a good recipe for sleep recovery. The next day, I was surprisingly refreshed and felt good. The only parts of me that were problematic were my feet and a few spots of skin that were sunburnt. I thought for sure that I’d be mostly horizontal but in fact, I was fairly active with a few games of HORSE on the basketball court, and various other antics in the pool with Brad including a doggie-paddle race, and a joust contest with pool “noodles”. For that matter, I actually felt good physically for the entire rest of the Hawaiian trip, including the many excursions that Roya and I went on in Maui in the week that followed. I was still mentally exhausted though, and I remain that way insofar as the Ironman concept goes. It was in all ways such a difficult day given all the problems I faced, and that I had to battle the weather and my body for such a long period of time. So now, I find myself asking if I’ll do this to myself again. The short answer is I don’t know. Part of me wants to be able to say that I’ve done an Ironman on every continent, and that I should look forward to maybe shooting for Ironman Australia in a few years, and thereafter Ironman South Africa, and thereafter some Ironman event in Asia, e.g. Korea, China, or Japan. For now, these are distant considerations. Next year, in 2012, my plan is fairly straightforward. I intend on completing 12 triathlons, mostly of the short distance variety. Doing so will get me to my 100th triathlon finish, a goal that I began to pursue after I finished my 50th triathlon some years ago. I did get goaded into competing in a half-Ironman event, but in contrast to what I faced this year with two Ironman events, half that distance seems like a walk in the park. Other than that, it should be a fun year, one where I’ll get to actually race versus focus on survival. 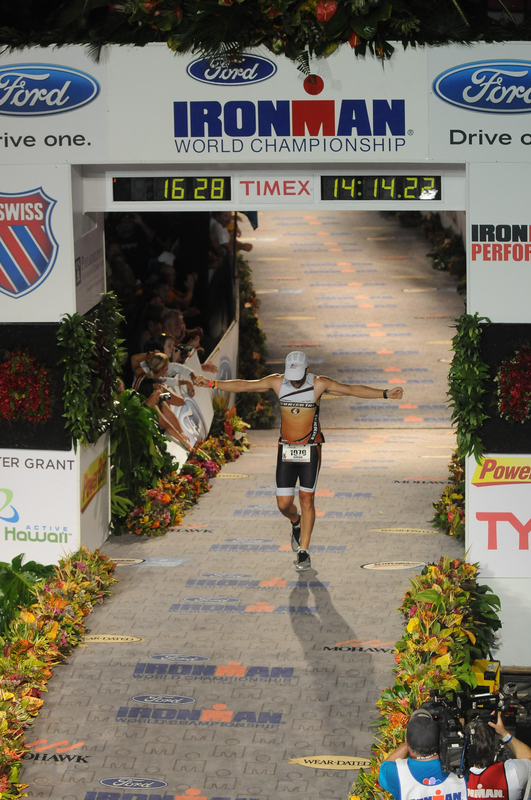 I’ll never forget the things I experienced this year, especially in Kona. It was the biggest athletic achievement of my life, and while I am very disappointed in not having done better, as measured against what I believe my potential to be, it was an incredible experience to run down that finishing chute. I still can’t believe that I got to do that, and perhaps in time, I’ll look back and revel in my good fortune. I remain committed to remembering my three thank yous: 1) for living in a free country where I can train and race without fear of repression or violence, 2) for having a functional body with four working limbs and with good health, and 3) for having been born to educated parents who ensured that I too would be educated, thus enabling me to get a good job and the ability to pay for this “hobby” of mine. Finally, I owe thanks to everyone who helped me get across the finish line. I have told a few people that with each of the four Ironman events in which I competed, I went through a sort of “roll call” where I recalled all of the people who are important to me. That list includes my family, my friends, my work colleagues, and many more. For those of you read this, you are likely on that list, and I’m grateful for all the love and support I received from you, whether you overtly provided it or not. Here’s a video of the finish courtesy of Angie.